Who hasn’t been welcomed by the warmth of the nervous chill that greets you when you open up a newly delivered package only to realize you thought about everything but how to set up? Even with the advent of DIY and self-help resources, it is easy to be overwhelmed by the reality to having to install anything by yourself, so much that the euphoria of the new purchase soon flickers away under the pressure of new responsibility. Caravan solar panels are worth it – solar power itself is somewhat magical; with all the right materials in hand, it could free you to set out in your motor home both comfortable and untethered, to explore uncharted waters. 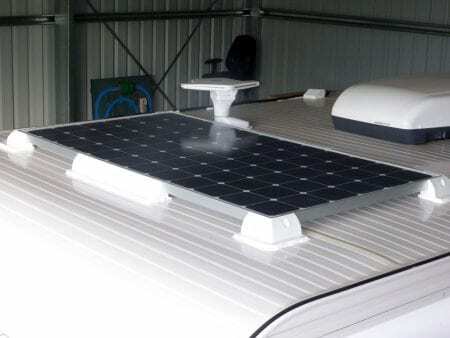 What Is Involved In Installing A Solar System Onto A Caravan? If you haven’t yet purchased your solar kit or panels, you are very likely going to be faced with the small dilemma of whether or not to purchase the system in individual pieces or to buy an entire solar panel kit. While some purchases will grant access to some ‘professionals’ that will install as well, it also costs quite a pinch, so you might be much better off giving it a shot yourself with the chance to save up to £100+ or more. Set up time should be no more than 10-12 hours, and after a full solid day or two of effort; you should be set up for a very long time. h) And a Ladder (Or some other way to get to the top of your van or RV) – that is, if you would be installing the Solar Panels on the roof of the RV. If The Panels Cannot Be Mounted On My Roof Are There Any Other Options? While it might seem like the usual norm to strap your solar panel(s) to the roof of your motor home, there may be concerns about the weight of the solar panels on the roof, especially if your panel has embedded aluminum frames, heavy glass coverings or extensive mounting brackets. So, in the event that a roof-mounted system proves to be an impractical option, then portable panels may be used. Whatever your choice, the ideal position of the solar panel should be in direct sunlight for the best performance, the panels must also be perpendicular to the direction of the sunrays and must not be partially shaded; and so, the question of setting up the solar panel inside, but close to the window is often not recommended. How Are Solar Panels Attached To The Roof Of The Caravan/RV? There are a few things that are peculiar to each set up, perhaps – how many panels that may be combined and whether or not you want a permanently installed set up, besides these peculiarities the process is simple and straight forward. Step 1: Get the panels ready for installation on the van by first attaching all the mounting brackets, feet and pre-wire crimps and other attachments. Step 2: Put the panels on top of the van while putting into consideration; how to route the wires inside the van, their proximity to your roof rails (if you are planning to install an awning), or a relative location to a rock box, if you are getting one of those. Remember; 45 degrees north – or approximately. Step 3: Drill a hole to route the panel wiring inside – you may use a tap hole followed by the 1.25” metal hole saw. It may also be important to paint over the edge of the hole to prevent rust. But, if you are skeptical about drilling, there are alternative ways to install solar panels, see the video below. Step 4: Proceed to join multiple panels (if you intend to) by combining the wires between the panels before routing them through the hole you recently drilled. You may use a combiner box and mount it under one of the panels and seal it down with the caulk to prevent leaking. Step5: After installing the combiner box, proceed to mount the panels on the roof – you may either use 3M adhesive pads or choose to screw the panels into the roof, which may work but improve the likelihood of rust or leakages,. Also put a layer of self-leveling sealant over the top of the solar panel feet/adhesive pads to prevent dirt and water from compromising the attachment. Step 6: The internal wiring could be easily done by following all the wiring diagrams that accompanied the kit or panel – otherwise, Bimble Solar provides a long list of installation diagrams that could help. You may then proceed to mount the charge controller inside the wall with flush mounted face-places after finalizing the interior. Are Tilting The Solar Panels Worth The Effort? The promise of obtaining more solar power after tilting the solar panels may be valid but be slightly exaggerated, you may get the additional 40% solar panel that tilting assures even in the winter months, but if the sun is 30 degrees off from how your panel is set you may end up losing around 13% of the power. On the plus side, tilting the solar panels means easier access to the roof for weather proofing inspection, solar panel wire inspection and roof repairs – not to mention that tilting the panels helps to keep them cooler when the sun is beating down on them. Gone with the Wynns article on RV solar tilting is a helpful resource if you are considering tilting the Solar panels anyway. · It may be a slight challenge deciding where to mount the remote display and charge controller; however, the remote display must be where it could easily be seen from, but also in a position where the lights also do not bother you at night. · The charge controller also needs to be close to the batteries – and while there may be no need to look at the charge controller, it has to be in a semi-accessible spot in the very least, because there would be a few wires running from it to the battery, and you might need to run a ground wire from the charge controller to the frame. · If there is a chance that you might need to disconnect the power that comes from the panels before the charge controller – you know, if you ever have to change the controller or move it to a different spot; then you might consider picking up some 20A switches, a box to mount them in and a cover – then you can connect the wires from the panels to the switches and simply flip them off and on as needed. · Also, and perhaps most importantly – if you are reading this and feeling a tad over your head, then it might be a good idea to hire a professional, sit down, crack a cold one and let your money work – we also aren’t responsible for the things you do with our generous wealth of information.